>>> three young children are dead. the kids 8-year-old twin boys and their 5-year-old sister was found dead in an explosion. the parents are from california and colorado and were locked in the custody battle over the kids. police say they are treating the deaths as suspicious. the mother is in the hospital after she jumped out of the window during the explosion. 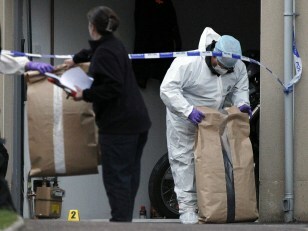 Police officers gather evidence at a crime scene in Edinburgh, Scotland, where three children died Wednesday.